Chicago and Detroit, located less than 5 hours drive from each other, are both southern gateways to a very interesting region of the Great Lakes. They were once two of the greatest American cities, huge industrial powerhouses, magnets for countless migrants from around the world and other parts of America. In short, two capitals of the Midwest. However, in recent decades their fates couldn’t be more different. 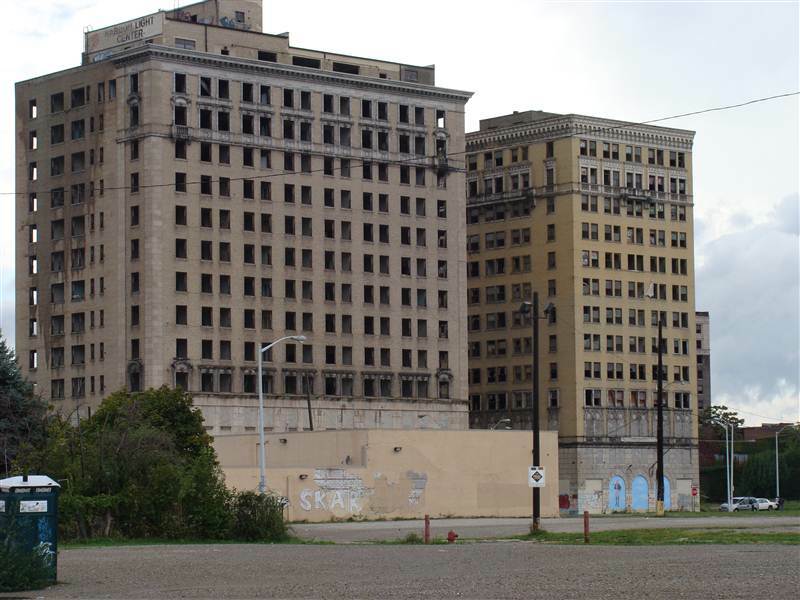 While Chicago is still a booming and attractive metropolis, Detroit has become a byword for urban decay, collapse and blight. At least that is a common picture in the media, the internet and among most people you speak to. I decided to check for myself how much truth there is in this image. Let’s start with Chicago. It had been on my list of places to visit ever since, at the age of about 11 or 12, I got hold of a coffee table book about the Windy City. It wasn’t very large or thick, it was actually a rather modest publication, but it was full of pictures which, back then, looked very strange, exotic and exciting. Finally, last year I had a chance to visit Chicago as it was the most convenient and economical place to start my tour of the Great Lakes. I landed on a beautiful sunny September afternoon, full of excitement and anticipation. After joining my friends who live in one of the countless Chicago suburbs (by the way, thanks for offering me a place to stay, Lukasz and Kasia), we all headed downtown, where we arrived just in time to experience a truly fantastic sunset over the city skyline. 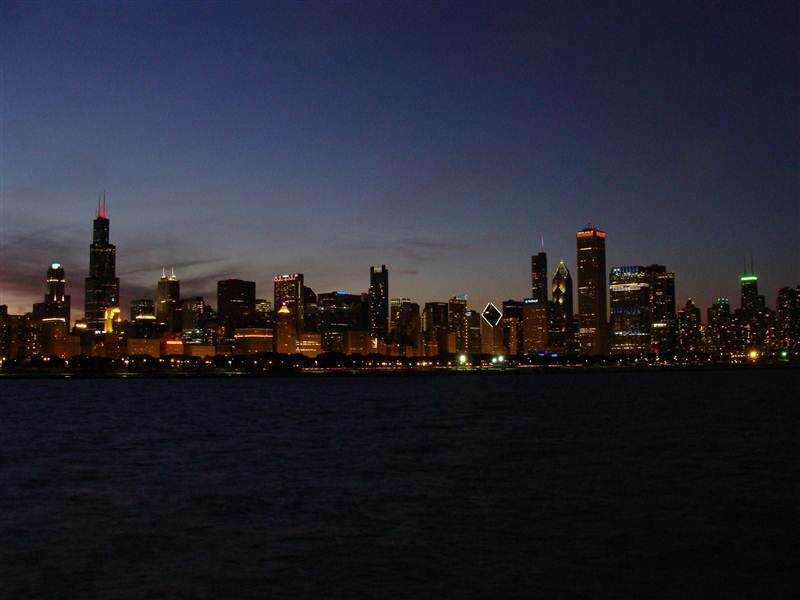 One of the best spots to see the Chicago skyline is in front of the Adler Planetarium, located just south of Grant Park on a piece of land jetting into the Lake Michigan. When it got completely dark we headed north of the downtown to a neighborhood called Wrigleyville. Its name comes from the Wrigley Field baseball stadium, home to the Chicago Cubs, and it is a great place, full of bars, pubs and restaurants. The stadium itself is the second oldest ballpark in the National League (after Fenway Park in Boston). One of the unique features are seats on the rooftops of the neighboring buildings, many of them feature bleachers, open bar, specialty food items, and a unique game-day atmosphere. It wasn’t a game-day when we visited the place, but it was a Saturday night so the whole area was still fun, with bars full and lively. We headed back home way after midnight but still managed to get stuck in a traffic jam around 2am which, I guess, indicates how a lively place Chicago is (or, for those who like to moan, how bad the roadworks can get). The following day the weather turned bad. And I mean really bad. It had been pouring with rain since the early morning, but it didn’t deter me from touring the downtown. 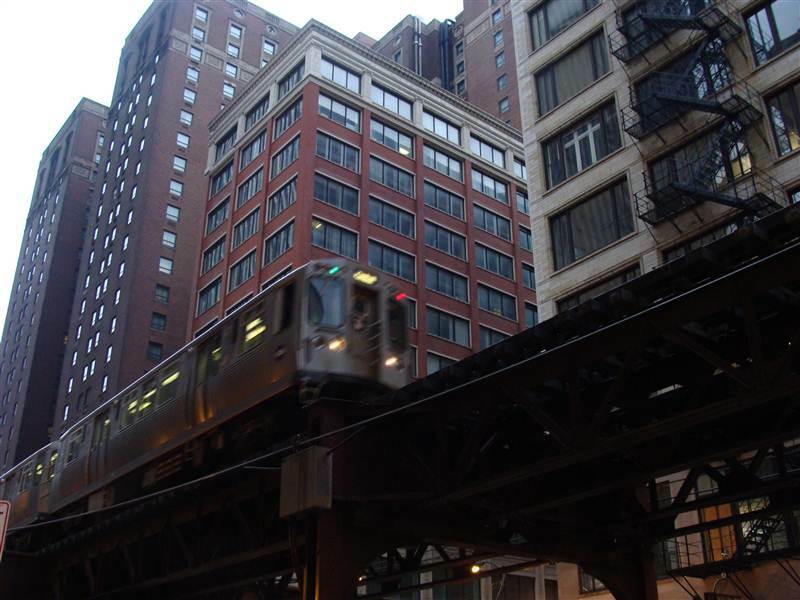 The heart of the city of is called “the Loop”, which comes from the loop formed by the tracks of the famous elevated trains, called simply the “L”. These iconic trains are the best way of coming into town. We left our car in one of the northern suburbs and took a red line southbound train. Now, the “L” trains are slow, noisy and quite dated but as they run mostly on the elevated tracks they offer unparalleled views of the cityscape. In my opinion, you can’t skip them during your visit to Chicago. It would be like visiting London and never using its equally dated and noisy Underground system; it’s possible but it would be totally missing the point (and ,in Chicago’s case, some great views as well). As you might know by now (if you follow my blog), I am an infrastructure geek so I took plenty of pictures of trains, elevated tracks, wooden platforms and dodgy, dim-lit stations with antiquated ticked gates. I had to wanted to experience Chicago’s elevated trains ever since I got the book I mentioned earlier, and I definitely wasn’t disappointed. It was every bit as much fun as I expected. But of course there is much more to see in the downtown district than just trains. Ultimately, Chicago is often called the birthplace of the skyscraper and it is home to the tallest building in the USA, the 108-story (442-m) Willis Tower (still probably better known as the Sears Tower). You can’t miss its black multi-rectangular shape, it’s visible from most of the vantage points in the city. There is a viewing deck on the 103rd floor, but it is quite a pricey attraction. A good alternative is the S ignature Lounge at the 96th which, as the name suggests, is located on the 96th floor of the John Hancock Center, the 4th tallest building in Chicago. It is a free entry bar which offers amazing views of the city, four states and up to over 80 miles. All you need to do is to order a drink and enjoy the view. As I mentioned before it was a rather rainy and cloudy day when I visited Chicago so the views were a bit obstructed but, on the other hand, how often can you see buildings wrapped in clouds. 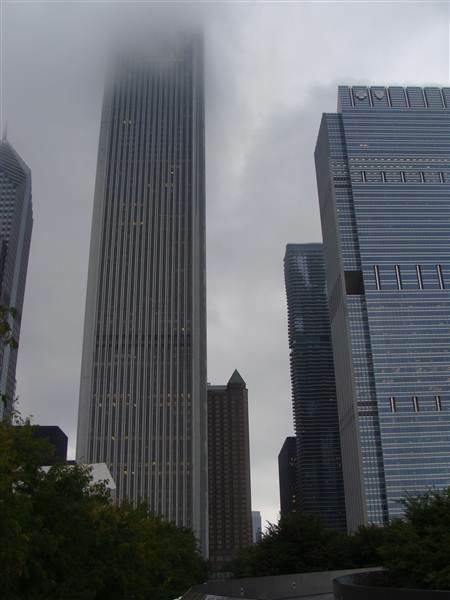 The Willis Tower, the Trump Tower (second tallest in the US), the Aon Center (formerly The Standard Oil Building, fourth tallest in the US)) were all at one time or another piercing the clouds. The Hancock Center is one of the most famous buildings of the structural expressionist style and the skyscraper’s distinctive X-bracing exterior is actually a hint that the structure’s skin is indeed part of its “tubular system” .Original features such as the skin and its trapezoid shape have made the John Hancock Center an architectural icon. In general, Chicago is full of exciting iconic architecture. 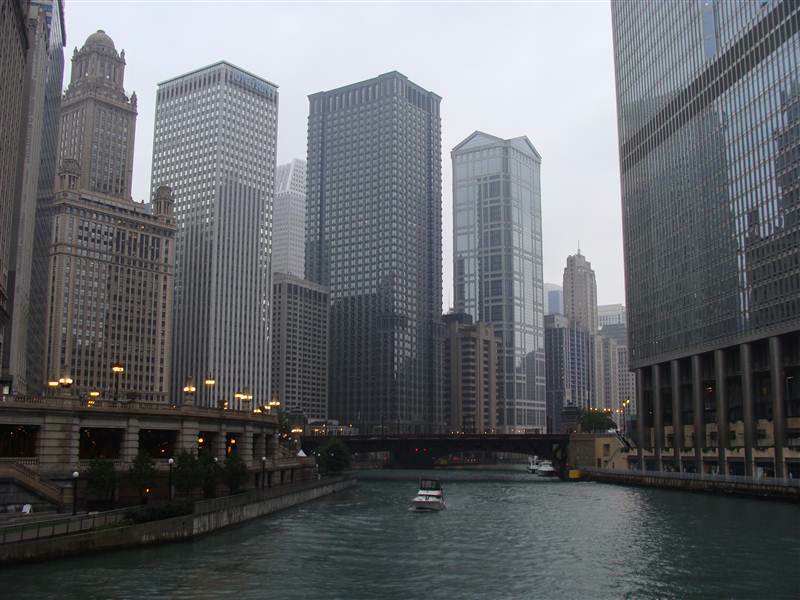 There are the famous classics like the Tribune Tower or the Wrigley Building as well as some modern additions like one of my favourites, the Aqua Tower. The architect stretched its balconies outward by as much as 12 feet (3.7 meters). The result is a building composed of irregularly shaped concrete floor slabs which lend the facade an undulating, sculptural quality. The name Aqua refers to the wave-like forms of the balconies. Downtown Chicago also provides a unique opportunity for anyone interested in bridges. In a mere two miles, there are eighteen movable bridges. While the most celebrated bridge is the double-deck at N. Michigan Avenue, there are seventeen other examples of beautiful Chicago bridges. An easy stroll along the Wacker Drive offers glimpse of the evolution in design of the movable bridges. Another great bit of Chicago is Grant Park, especially its north-western corner, the Millennium Park. Recently renovated, it offers some striking art installations. 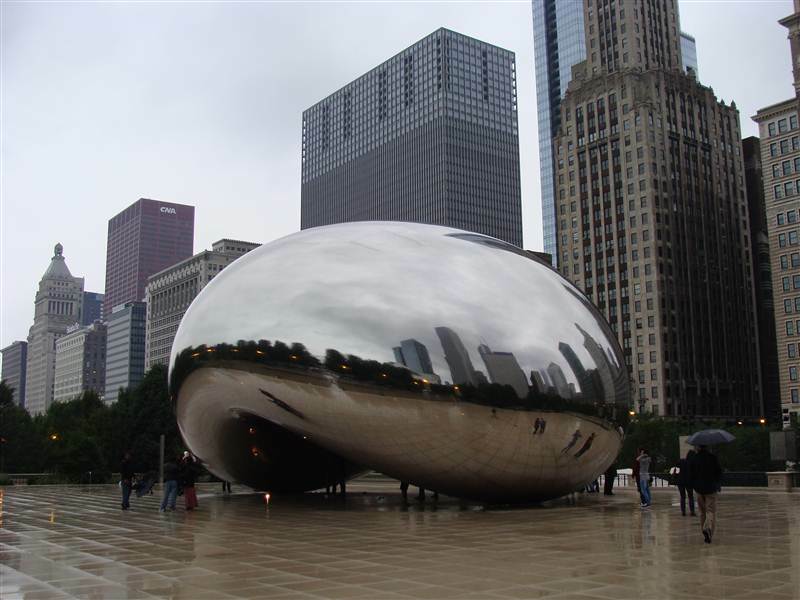 One of them, called the Cloud Gate, quickly became one of the city’s icons, featuring for example on the Lonely Planet guidebook cover. Constructed between 2004 and 2006, the sculpture is nicknamed “The Bean” because of its shape. Made up of 168 stainless steel plates welded together, its highly polished exterior has no visible seams. It is a great fun simply taking pictures of your own distorted reflection in “the bean”. Another installation, located nearby, is Crown Fountain, an interactive work of public art and video sculpture. The fountain is composed of a black granite reflecting pool placed between a pair of glass brick towers. The towers are 50 feet (15.2 m) tall and they use light-emitting diodes (LEDs) to display digital videos on their inward faces. Water intermittently cascades down the two towers and spouts through a nozzle on each tower’s front face (which at the same time displays a human face). Even on a rainy day plenty of people were having fun wading in the water and taking pictures. Finally there is the Frank Gehry-designed Jay Pritzker Pavilion, which is effectively a big and extravagant bandshell. Millennium Park is in my opinion a great example of public space design. Sophisticated but still people-friendly, you don’t have to be an art critic to enjoy it. Chicago is a truly vertical city. There are numerous buildings literally scratching the sky, but there are also elevated railways and double-decked and even triple-decked streets. It all gives it in places the appearance of some futuristic labyrinth so it shouldn’t be surprising that it is often used as a filming location. Most recently Batman Begins, The Dark Knight or Transformers: Dark of the Moon all used locations in the downtown loop. On a rainy day this amazing city looks very mysterious and magical. I really enjoyed every minute of my Chicago exploration and would happily spend more time there, but it was time for me to leave the Windy City and head north. Now, Detroit. I arrived there a few days later after touring the northern part of Michigan. Unfortunately, the weather was very similar to the one I experienced in Chicago. Maybe just a bit less rain and more drizzle. I parked my car in the enormous complex of Renaissance Center which is a huge concrete labyrinth, home to the world headquarters of General Motors. It is such a big and convoluted building that it took me quite a while to find my way out to street level. However, if you are interested in slightly brutalist concrete interior design (as I am), you will probably find it in some peculiar way a fascinating building. One of the first things I noticed in Detroit was how quiet its streets are. 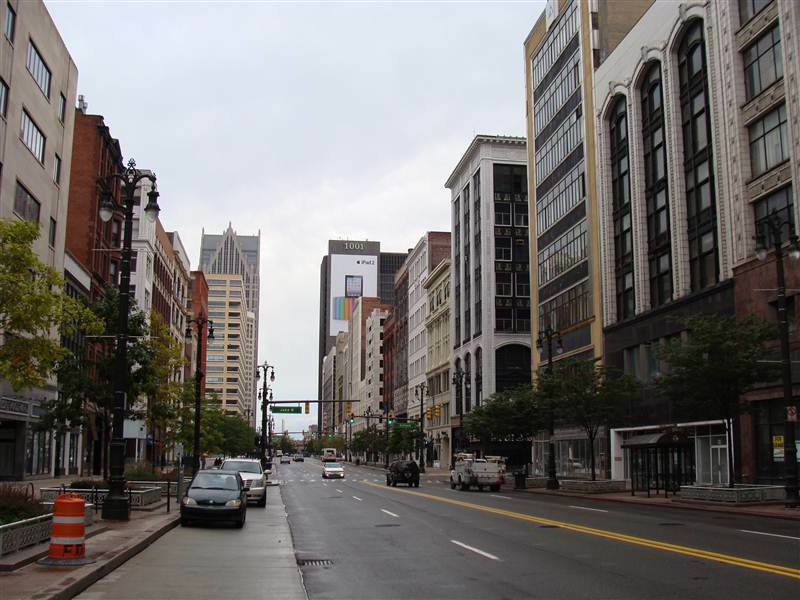 If Chicago was full of pedestrians then Detroit looked almost deserted. You can clearly see that its downtown was built to serve a much larger population. I guess such a situation is what you would expect from a place representing the ultimate urban collapse. Many building had boarded windows and doors in places which once hosted busy shops or restaurants. The second big surprise to me was the amount of really good architecture. Detroit is for example home to some beautiful Art Deco skyscrapers built in the 1920s. The Penobscot Building, named after the Penobscot, a Native American tribe from Maine, is one of my favourites. 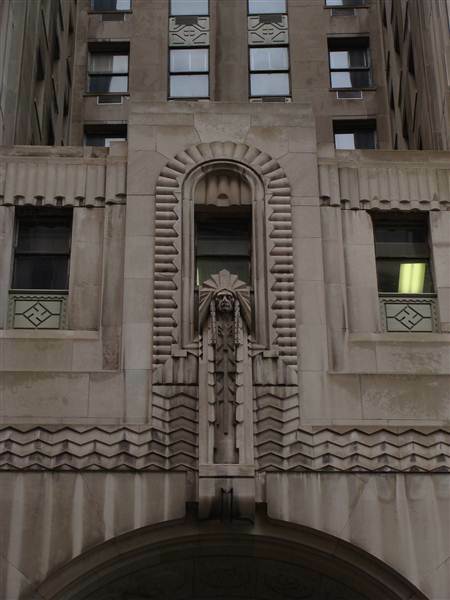 Native American-styled ornamentation is used on both the exterior and interior, particularly in the entrance archway and in metalwork found in the lobby. Upon its completion in 1928, the Penobscot became the eighth-tallest building in the world and the tallest outside New York and Chicago. It was also Detroit’s tallest building for a nearly half a century, until the Renaissance Center overtook it in 1977. When you walk around it pay attention to a beautiful sculpture of a Native American on top of the main entrance. It’s fantastic. 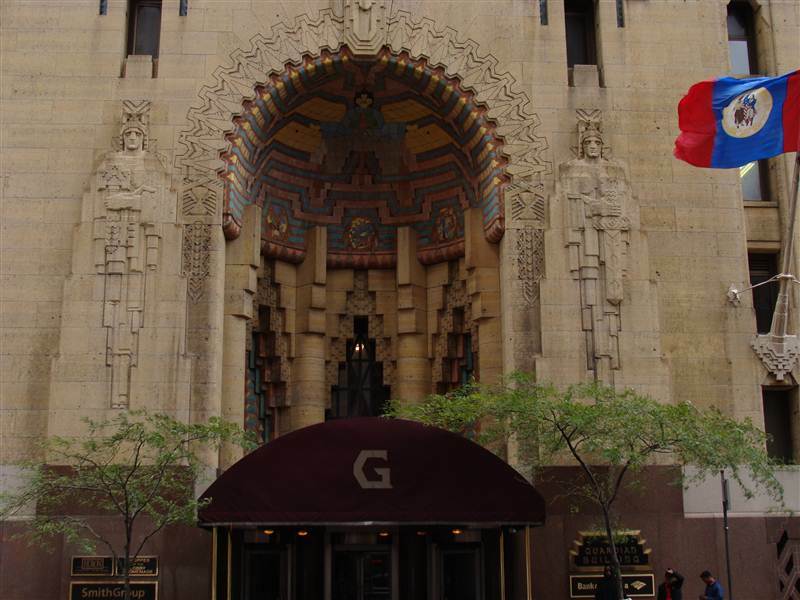 Another favourite of mine, also built in 1928, is The Guardian Building. You won’t miss this one due to its striking red exterior, which blends brickwork with tile, limestone and terra cotta. The building rises to 36 storeys and is capped by two asymmetric spires, one extending for four additional storeys and that’s where a large American flag flies. There too, the Native American themes are common inside and outside the building. For example, the main entrance looks like some Aztec temple and is guarded by two huge sculptures of Indians. It’s easy to understand why it was nicknamed the Cathedral of Finance. Of course there are many more amazing skyscrapers from that era: the improbably ornate Fisher Building, the Italian Renaissance-style (and sadly unoccupied) Book Tower and also another striking red, The David Stott Building are only few examples. The layout of downtown Detroit is also interesting, with streets radiating from the semi-circular Grand Circus Park. One of them is the grandiose Woodward Avenue which runs almost dead straight for 21 miles (35km) from the downtown to the North West of the city. 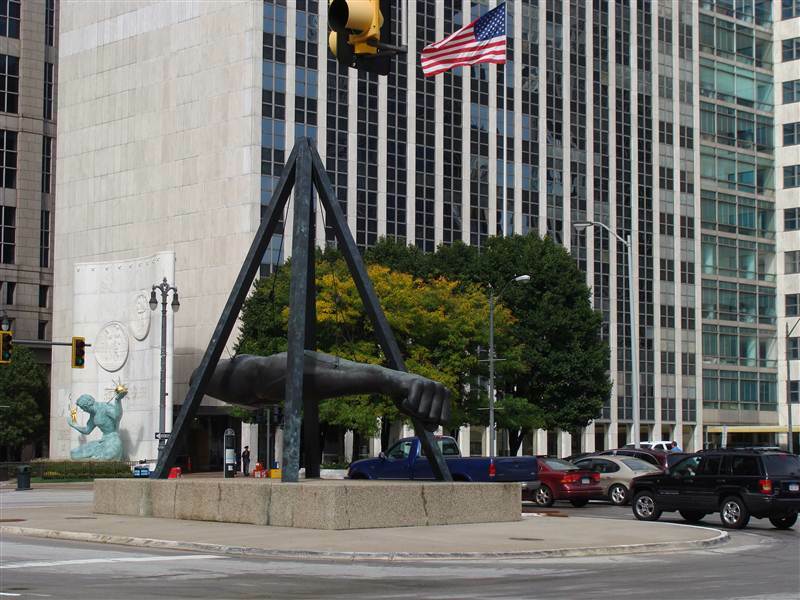 Its most impressive architecture is concentrated in a short stretch of this road, known as a Merchant’s Row, which is located between the Grand Circus Park and the Campus Martius Park. The Lower Woodward Avenue Historic District (as it is officially called) contains 34 commercial buildings built at the end of the 19th century and the beginning of the 20th many by noted architects. These are truly beautiful buildings. Unfortunately, the Avenue is nowadays quite an empty and sad place. There are a few shops but also a lot of empty store fronts, even whole buildings are unoccupied. It is especially depressing considering the fact that it was once (in the 1920s) one of the busiest shopping districts in America. But the empty buildings of the downtown are nowhere near as bad as some of the districts bordering it. There, whole city blocks have been levelled to the ground. Occasionally, you can spot some dilapidated buildings, which actually make it look even worse than the empty lots. And you really don’t have to go far to find such places. Continue walking the Woodward Avenue north and after just a few minutes past the fabulously renovated Fox Theatre, after crossing the bridge over the Fisher Freeway, on your left you will see the urban desert. I was really tempted to explore these fascinating parts of Detroit but it is not a good idea without someone with good local knowledge as it can be quite dangerous if you don’t know where it is safe to go. What makes this part of the city even stranger is the fact that on the other side of the Avenue there are some modern apartments. I wonder if this one complex is a sign of the future or just a mistake. Parts of Detroit immediately west of downtown are in a bit better shape and are home to a large Latino community. But even here there are abandoned houses and huge swathes of post-industrial wasteland (especially south of the I-75). I stopped here for a few minutes just to take a photo from the pedestrian bridge over the freeway towards the skyscrapers of the downtown. The whole structure was in such bad shape that I seriously thought it was going to collapse under my weight. It looked like it was made of rust and gravel rather than steel and concrete. I was really glad to be off it as soon as I was done. Especially that some locals started showing suspicious interest in my car. I spent only a few hours in Detroit, but found it an absolutely fascinating place. It is rough, grim and sad, but also at the same time photogenic and, in a strange way, a beautiful city. I definitely want to go back there and explore it properly, hopefully with some people who live there who could show me all the faces of this fascinating city. There are so many more interesting ruins to see, for example the once-fabulous Michigan Central Station or one of the largest industrial ruins in the world, the Packard Factory. I would love to wonder around them with a good camera. So, as much as I like Chicago (and I really do like it), if I only had the chance to go back to one of those two cities I would chose Detroit. It is simply a unique place, the perfect destination for adventurous tourists with some slightly edgy interests. This entry was posted in Uncategorized and tagged Aqua Tower, Chicago, Detroit, elevated trains, Grant Park, Guardian Building, John Hancock Center, Merchant's Row, Millenium Park, Penobscot Building, The Bean, The Cloud, The Loop, Windy City, Woodward Avenue on January 27, 2012 by admin.